At Absolute Compassion, we are committed to providing the best hospice care experience available. This commitment is evident in the personal and compassionate care that we provide to our patients everyday. In every area of hospice care, we strive to do more than what is required—and expected. The desire to do more can be seen in the passion and dedication of our staff and volunteers. It can also be measured by the services we offer, which go above and beyond what typical hospices offer. Individualized hospice plan of care that is managed by the hospice team of nurses, social workers, home health aides, volunteers, and non-denominational chaplain. Coordination of care with the hospice Medical Director and/or PCP for the medical management of symptoms and pain. Skilled nursing visits on a scheduled basis, and additional visits as needed 24/7. 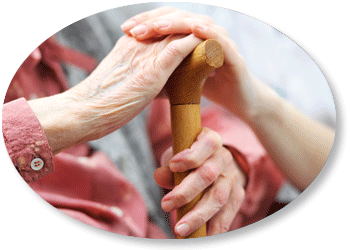 Provision of instruction and support on caring of a loved one while on hospice care. Personal care, and assistance with activities of daily living provided by our home health aides. Psycho-social, and emotional support/counseling provided by our Medical Social Worker. Spiritual support, and grief counseling provided by the local community clergy, and/or our chaplain. Provision of resources for assistance with legal, financial, and end-of-life matters. Hospice-related medications, medical supplies, and medical equipment are covered by Medicare, at no cost to the patient or family. Our hospice volunteers are available to provide companionship, and assistance with non-medical needs.